YUP Korean Barbecue: The Cheapest Unlimited Samgyupsal I've Ever Experienced in South! "Friday nights should be celebrated." This is what I always tell myself on Friday nights since for me, it is a way of paying for the hard work I've had all through out the week. It is the time where I let go of all my stress, exhaustion and anxiety from my day job. I have various ways to celebrate my Friday nights. It's either I hit the hay early for some good sleep or go out with friends and family to pig out (though it sounded more like I am stress eating). Most of the time, I choose the latter as I get to spend quality time over a cup of coffee or good food with these people that I have not really talked or seen quite some time. Well, just recently, I found a new haven for my Friday night celebration at the south. Unlimited Korean barbecue is quite a thing now. Both the quality and quantity, not to mention how presentable the food and how vibrant the table appeared, are extremely inviting. 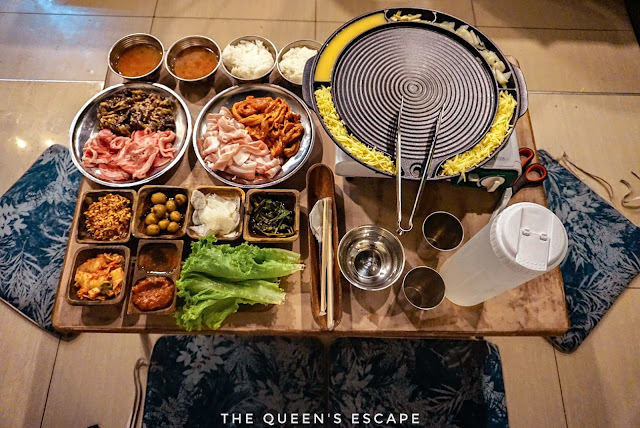 There's been a lot of Korean restaurants all over offering this but I have found one which I think should be tried by many most especially by those who are from or at least visiting the south as its cheaper than most of what I have found and tried - the YUP Korean Barbecue in Imus, Cavite. Yup Unlimited Korean Barbecue Restaurant is located at Palico 4, Imus Cavite. It is open everyday from 4:00 PM to 12:00 MN. However, they cut off at 10:30 PM for restoration and preparation. The restaurant can accommodate guests occupying up to 8 tables at a time. On my visit, I tried their unlimited pork and beef. We were served with four kinds of meat - samgyupsal, spicy samgyupsal, beef bulgogi and woo samgyupsal. 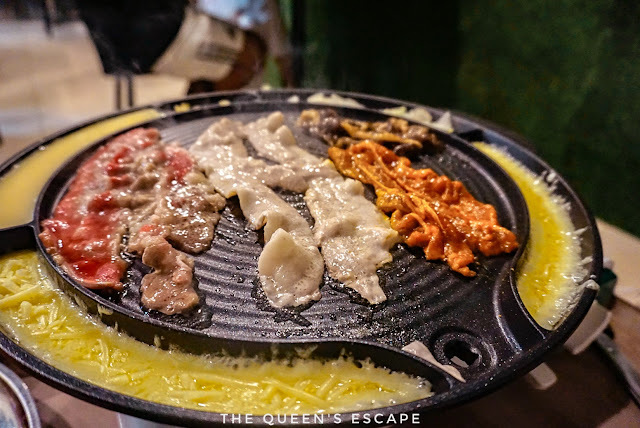 Their side dishes are a little different from the other restaurants offering unlimited Korean barbecue that I have tried. Theirs include kimchi, muu (pickled raddish), egg, nolyeonhan sigeumchi (seasoned kangkong), kongnamool (Korean soybean sprout), lettuce, soup, algamja-jorim (braised potato marble) and of course, cheese! 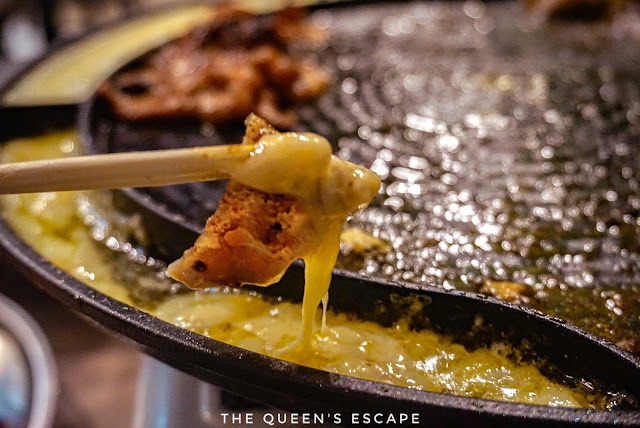 Cheesy samgyupsal is among the best things in life! S E R I O U S L Y, lol) They also serve rice which is also unlimited. 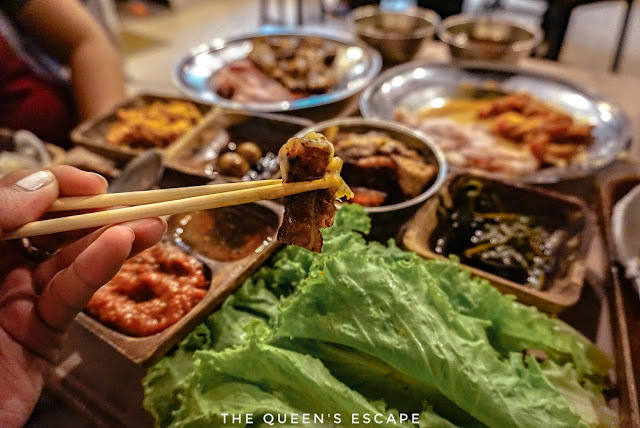 For those who would only like to try the unlimited pork which is at Php 390.00 per head, the guests can enjoy unlimited samgyupsal and the spicy one along with the other aforementioned dishes. 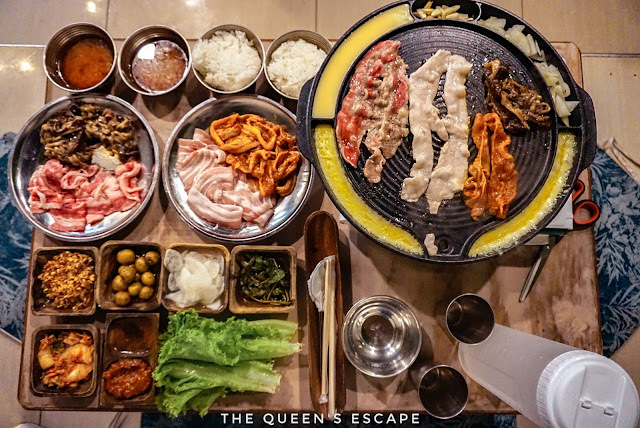 Apart from the unlimited Korean barbecue, they also offer ala carte meals starting at Php 129.00. This include bulgogi, bulgogi japchae, bibimbap, japchae, bulgogi kimchi bokkumbap. 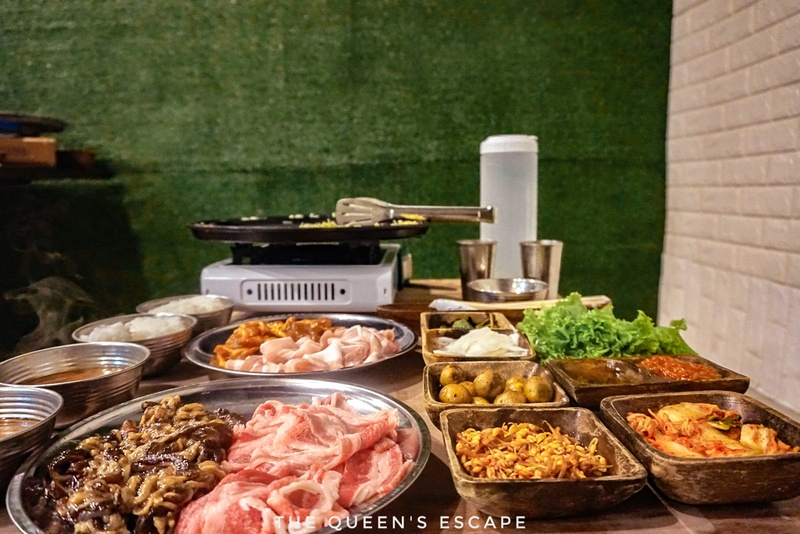 Guests can also try the Korean barbecue at Php 299.00 to Phph 399.00 with 800 grams of meat and side dishes at Php 39.00 each. You can either at the table with chairs or sit down on the floor and eat like a Korean in their place! The restaurant is strict about their NO Leftover Policy. They will charge the guest an amount of Php 200.00 if there are cooked or uncooked meat left on the plates. But who would? Surely, you'll be able to finish it too as these are really good and fresh meat! 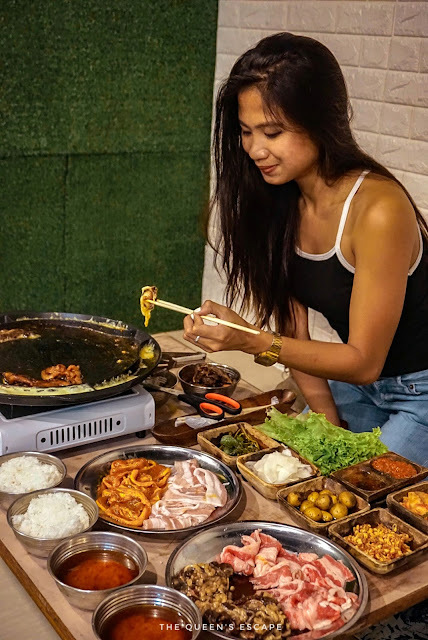 On Mondays to Thursdays, they offer a special promo where the unlimited pork (samgyupsal) is at Php 299.00 and the unlimited pork and beef at Php 399.00 - the cheapest I've found so far! Kids from 7-10 years old are given 50% discount while the ones who are six years old and below are considered free of charge. 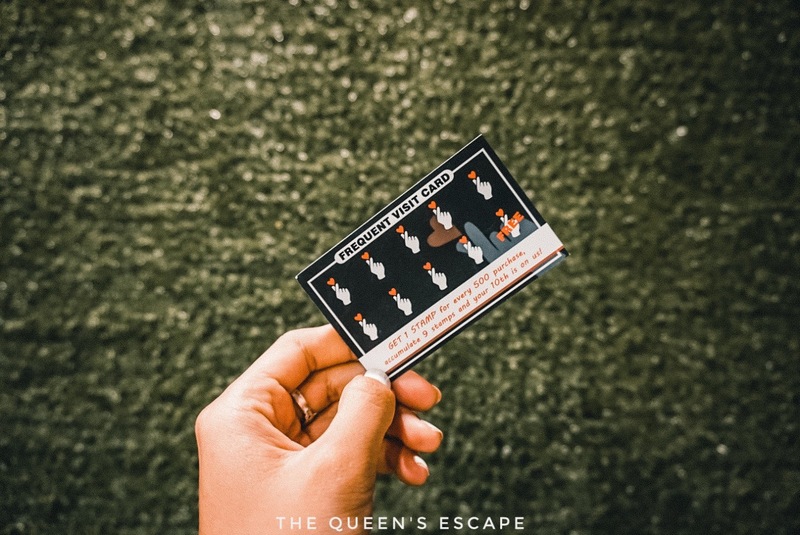 Apart from this, they also offer the guests a Frequent visit card. The guests get a stamp in his or her visit in every 500php purchase per table. Should they accumulate 9 stamps, they'll get samgyupsal treat from the store. Their Frequent Visit Card. You may simply ask one from their staff-on-duty. >From Pasay/ Buendia, take a bus bound for Nasugbu, Calatagan Lian, Pala Pala, Trece or Indang. >Alight at MCI (Hospital) at Palico, Imus, Cavite. Personally, I love the food because they served fresh meat. The side dishes were also a different kind of good gastronomic adventure for me as these is not the usual ones that I try on the other Korean restaurants I've been. The staff are also approachable and would assist you with what they need. the only thing is that, they could only accommodate people that can occupy their 7 tables at a time. Thus, if the house is full, you'd have to wait to try their Korean barbecue. Unlimited samgyupsal are popping up just about anywhere these days and finding the right place to be your go to is quite the challenge. Would definitely include this place and find more exciting things to do in Imus, Cavite.